A great addition to your garden or outdoor area is the Pure Garden Plant Holder. 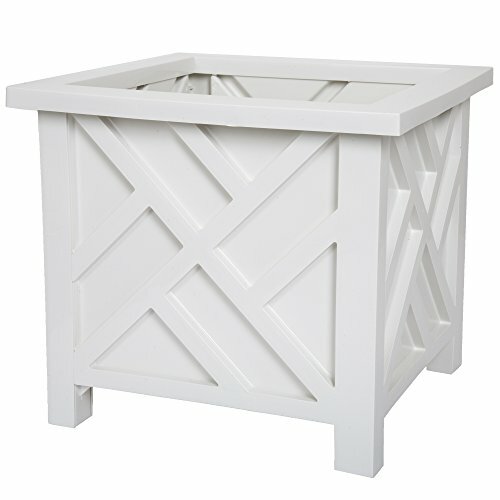 This durable white box plant box can hold and grow flowers and is maintenance free! A traditional lattice pattern is added to the sides to help enhance the look of the planter and your plants. A simple set-up with no tools required, simply snap it together! IMPORTANT: Avoid buying counterfeit products and transacting with unauthorized sellers. Look for our logo on the packaging for every one of our products. Pure Garden is committed to providing the consumer with the absolute best price and value on our entire line of products, which we ensure by applying a rigorous Quality Control process. ELEGANT OUTDOOR DÉCOR - Accentuate your home with the Plant Holder by Pure Garden! A traditional lattice pattern is added to the sides of the box to help enhance the look of the planter and your plants. Whether you live in a big house or a small apartment, you'll want to add a personal touch to your living space with this Planter Container Box. STRONG AND DURABLE DESIGN - Plant Holder by Pure Garden is made from durable white polypropropylene. The thick and sturdy walls have a sleek white finish that will make a great addition to your garden or outdoor area. A simple set-up with no tools required, simply snap it together! MAINTENANCE FREE - This stylish plant holder can hold and grow flowers with little to no maintenance! No more worrying about water accumulating because of the "t" shaped bottom that drains water while delivering oxygen to plant roots. SATISFACTION GUARANTEED - Pure Garden is committed to providing consumers with the absolute best price and value on our entire line of products. NOTE: This is an exclusive product of Pure Garden and ONLY Plant Holder by Pure Garden are GUARANTEED to be genuine.